How do I start with neurofeedback? A comprehensive assessment is where neurofeedback therapy begins. The assessment allows doctors to determine whether a client’s brainwave patterns are different from normal. Based on your brain map results, we then create a restorative plan of care. Each assessment provides the doctor with neurofeedback training protocols. These protocols are designed to retrain the brainwave patterns towards normal. The result of rebalancing these brain waves restores health, healing and functionality for lasting results. During neurofeedback sessions, doctors are actually able to identify abnormal brainwaves. The qEEG-report is the assessment process that allows us to determine the brain wave patterns by gathering information about the electrical activity of specific locations of the brain. To do this, we place what looks like a swim cap with a number of sensors on your head to measure the brain wave activity of the various frequency bands. This is done with the client sitting quietly with his or her eyes closed for approximately 5 minutes and then with eyes open for an additional 5 minutes. Our equipment will then analyze this information and generate a series of images that will identify which areas of the brain may be too active or not active enough. This is called a Brain Map. The Brain Map provides an invaluable overview of what is going on in the brain and will be used in conjunction with information provided by the client to develop the training plan. Sensors are placed on the head and ears to record the brainwave activity. High-tech equipment amplifies the electrical impulses and breaks them into the four key frequency bands. Using sophisticated computer software a customized protocol is developed to address the individual’s unique needs. During the session the Neurofeedback Clinician views the raw EEG signal as well as the chosen frequency bands. Exercises can be done with either eyes open or eyes closed. With eyes open the Client is watching a video or playing a game. The video fades in and out depending on whether or not the brain is increasing the desired. 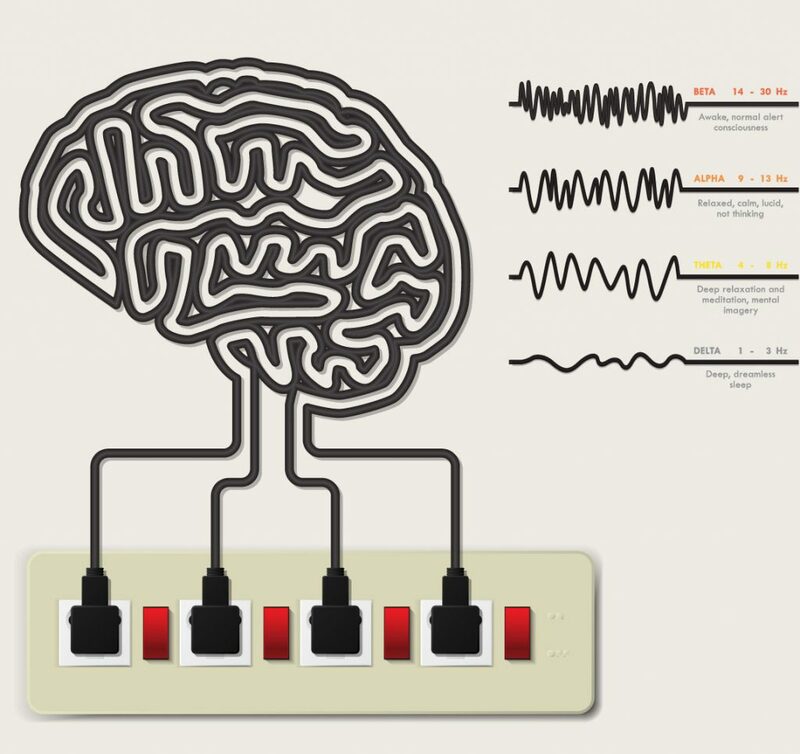 Neurofeedback takes advantage of the brain’s ability to change itself through a process known as Neuroplasticity. It utilizes the same learning process that occurs whenever we acquire a new skill. The brain learns by forming connections between nerve cells and utilizing important pathways that connect different locations in the brain. The more frequently you utilize these pathways the better the brain becomes at performing the associated task. In psychology, this type of leaning is called “Operant Conditioning”. It is a type of learning in which responses come to be controlled by their consequences. Quite simply, Neurofeedback offers the perfect learning conditions, since it facilitates awareness of when the brain is producing healthier brainwave patterns, provides reinforcement for the positive change and multiple opportunities to provide practice during a training session. What Does it Mean – Slow, Idle, Fast? The brain produces consistently higher magnitudes of delta and theta waves when it is in a slow processing state such as when it is relaxed or in deep sleep. Delta represents the slowest processing speed. Delta frequency is 1-4Hz, while theta frequency is 4-7Hz. Theta waves are produced consistently during deep relaxation. The brain produces consistently higher magnitudes of alpha waves when the brain is in an idle state. This is why alpha is sometimes referred to as the idle brainwave. Alpha represents a slightly faster processing speed (8-12Hz). When the brain is healthy and well regulated, it produces more alpha waves on the right than on the left side. The brain produces consistently higher magnitudes of beta waves when the brain is externally focused, alert, involved in critical reasoning, thought and concentration. Beta represents the fastest processing speed (12-30Hz) and when the brain is well regulated, it produces more beta waves on the left than on the right side. What Conditions & Why are So Many Different Ones Helped by Neurofeedback? Many disorders are caused by poorly functioning patterns in the brain. Now that extensive research has shown the brain can restructure itself and learn more adaptive patterns at any age, the likelihood of symptom improvement becomes much more understandable. Neurofeedback is actually changing imbalances and altering brain pathways, not targeting specific disorders. This amazing ability of the brain is particularly noticeable in cases of traumatic Brain Injury (TBI), Stroke or other physical trauma to the brain. Regardless of whether certain areas of the brain are overactive or underactive, Neurofeedback can encourage the brain to self-regulate and ultimately produce more healthful brainwave patterns and change thinking and behavior patterns.